Coincidence makes for truly farcical bedfellows. The Geffen Playhouse has kicked off its new season, with the Yale Repertory Theatre production of Rolin Jones’ These Paper Bullets, a send-up of Shakespeare’s Much Ado About Nothing; Costa Mesa’s South Coast Repertory (SCR) has chosen to present the West Coast premiere of Richard Bean’s celebrated One Man, Two Guvnors, an update of Carlo Goldoni’s The Servant of Two Masters, in a co-production with The Berkeley Rep — and A Noise Within (ANW) went for David Ives’ version Georges Feydeau’s deathless A Flea In Her Ear, transported from the early 1900s to the early 1950s. 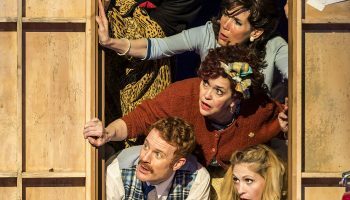 There is nothing quite as entertaining as a well written and well mounted farce and ANW, whose raison d’être is reviving the classics — ancient, middle-aged and modern — kicked off its 25th season with one of Feydeau’s best. Artistic co-director Julia Rodriguez-Elliott has proved herself time and again to be a terrific director, and her staging of this Flea In Her Ear only confirms it. Starting with the cast. 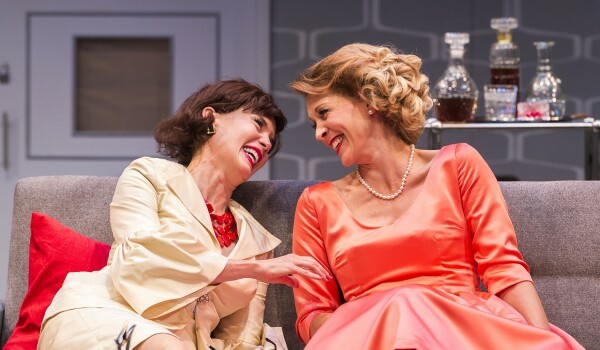 When you have Elyse Mirto and Jill Hill playing best friends, Raymonde and Lucienne, scheming to determine if Raymonde’s husband, Victor Emmanuel (the ever-inspired Geoff Elliot), is cheating on his wife, they get into all sorts of hot water. It is, of course, complicated by the various fiery intrusions of Lucienne’s suspicious Hispanic husband Don Carlos (Luis Fernandez-Gil), Victor’s nephew Camille (Rafael Goldstein), whose inability to pronounce consonants renders him incomprehensible altogether, slamming doors, an uppity butler (Alan Blumenfeld), a virulent case of mistaken identity and the rest of the farcical paraphernalia of which Feydeau was the uncontested master. The production is perfectly calibrated, delivering a couple of hours of great visual and aural fun. But Feydau gets an invaluable assist here from playwright Ives. An inimitable farceur in his own right, with a long list of smart plays to his name, Ives’ witty translaptation (his coinage for translation crossed with adaptation) is flaunted here in all its wild and woolly cleverness. Butler Alan Blumenfeld and soubrette Renna Nightingale in A Flea In Her Ear. No point in describing the zany plot. You either know it or soon will if you go. It’s the energy of the production that counts, with great pacing and timing. The nonstop action, immersed in the 1950s, provides splendid opportunities for inventive costume designer Angela Calin to display her special flair, particularly when it comes to the women’s outfits. But the costuming is only one of many right touches — including stylish sets by Fred Kinney, Tom Ruzika’s lighting, Val Miller’s period hair, wigs and makeup, and Robert Oriol’s clear (yes, clear) sound design and music. 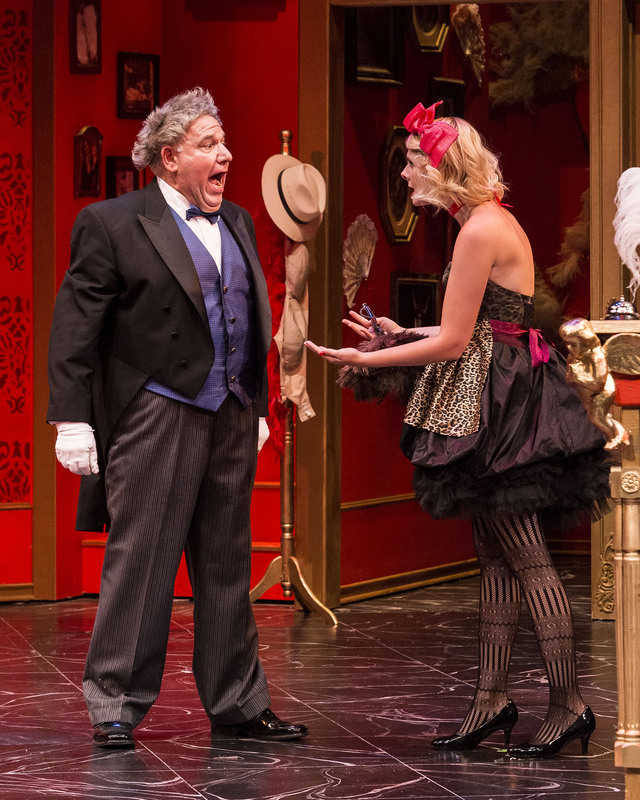 The whole is a cream puff of an entertainment that should enjoy a rollicking repertory run through November 22. WHERE: A Noise Within, 3352 East Foothill Blvd., Pasadena, CA 91107. WHEN: Check performance schedule at www.anoisewithin.org or by phone at 626-356-3100 ex 1. HOW: Single Tickets start at $44; Student Rush with ID an hour before performance, $20; Groups (10 or more): Adults start at $30 each, students start at $18. Top image: Jill Hill and Elyse Mirto in A Flea In Her Ear. 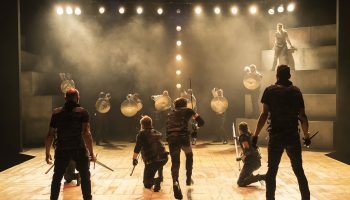 At the Geffen Playhouse, on the other hand, playwright Rolin Jones, has done quite a number on William Shakespeare (and us) with his These Paper Bullets, a Yale Repertory Theatre production presented in association with New York’s Atlantic Theater Company. You’ve got to admire the affront and the guts, because it’s not the number that you might expect. These Paper Bullets is no docile adaptation, but neither does it rise to the level of satire. Nor is it the kind of re-interpretation of Shakespeare’s Much Ado that induces fond memories of past productions. The Shakespeare is so deeply buried in this usurpation of Will’s comedy that it can be hard to spot at first. 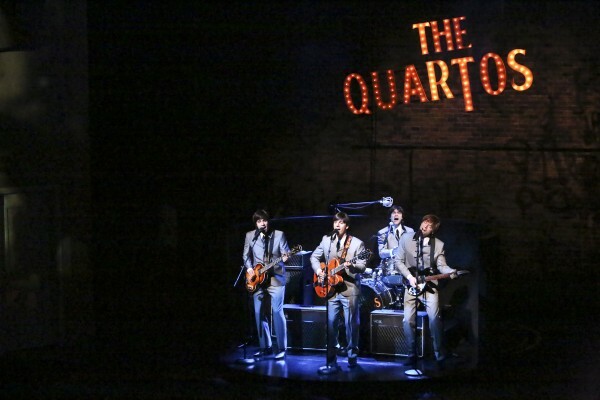 Bullets is not about the triumphant return of a warring army, so much as it is a reinvention of the triumphant 1960s invasion of London by those four musical lads from Liverpool, you know the ones, rebranded here as The Quartos: Pedro, Claude, Ben and Balth (Balth…?). This nonmusical is a play-with-music that transmogrifies the Shakespeare while remaining true to the barbs and sparring between Ben (short for you-know-who, and played by a deadpan Justin Kirk) and the smarter, strong-willed fashion designer Bea or Beatrice (Nicole Parker). It’s also true to the planned marriage of Higgy (Ariana Venturi as an ersatz Hero) and Claude (Damon Daunno), true to her betrayal by the villainous Don (Adam O’Byrne, now a demoted drummer and vengeful half-brother to Pedro), and true to Higgy’s eventual redemption, replete with happy ending and double-wedding. So the Shakespeare is lurking in there, but its dialogue traduced into a mod vernacular that is sometimes difficult to grasp thanks to over-the-top English accents. The subplot’s Constable Dogberry becomes Mr. Berry (Geg Stuhr) and his two blundering deputies Mr. Cake (Tony Manna) and Mr. Urges (Brad Heberlee) — all three now Scotland Yard operatives on a mission to uncover “what’s wronggg with the youth of England.” Answer: nothing. Well, not quite nothing. This 1960s “youth” has grown louder, smarter, more strident, spaced-out, rude and… musically gifted. Their speech is mock-Shakespearean drenched in the drug-drink-dream-scream (oh yes, scream) idiom of the period. The original songs, performed live, come from the pedigreed pen of Billie Joe Armstrong, front man for the award-winning Green Day. So there. 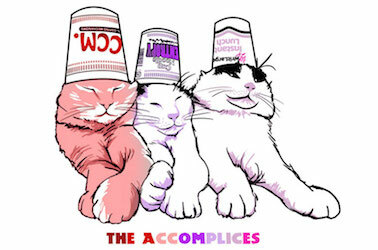 The cast of These Paper Bullets. There are the usual twists and turns that all such send-ups demand, as well as some bad-taste shenanigans that Shakespeare probably would wish they had omitted, such as the assumption that throwing up on stage (twice) is very funny, when in fact it’s only the cheapest laugh you can buy. And that’s a pity because, crass jokes aside, the rest of the script can be pretty pointed when you overcome the language barrier and can undesand what’s being said and done on the cluttered Gil Cates stage. The most engaging scene is the enactment of Higgy and Claude’s about-to-be-thwarted wedding, when the entire theatre converts to a wedding chapel, the aisles become naves, and we, the audience, are the guests, collectively enjoined by the presiding cleric to stand or sit — or sit or stand — to everybody’s giddy confusion. The wedding in These Paper Bullets. I wish I could tell you the rest of the production worked as well as that but, at almost three hours’ duration, Bullets is basically a self-indulgent inside joke that, in true collegiate fashion, too often mistakes questionable taste for humor, instead of trusting the script’s share of genuine wit and fun. On the plus side, credit designer Jessica Ford for some amusing beehives and inventive outfits worn by the women, and Tom Kitt for his fine orchestrations and musical arrangements. The show’s music is a major asset. Director Jackson Gay does not always adroitly manage the traffic on Michael Yeargan’s overstuffed sets, and too many microscenes and subplots make already convoluted situations harder to penetrate than they need to be. WHERE: A Yale Repertory Theatre production presented by The Geffen Playhouse, 10886 Le Conte Ave., Los Angeles, CA 90024. WHEN: Tuesdays-Fridays, 8pm; Saturdays, 3 & 8pm; Sundays, 2 & 7pm. Ends October 18. HOW: Tickets $32-$82, available in-person at the Geffen Playhouse box office, via phone at 310.208.5454 or online at www.geffenplayhouse.com. Fees may apply. 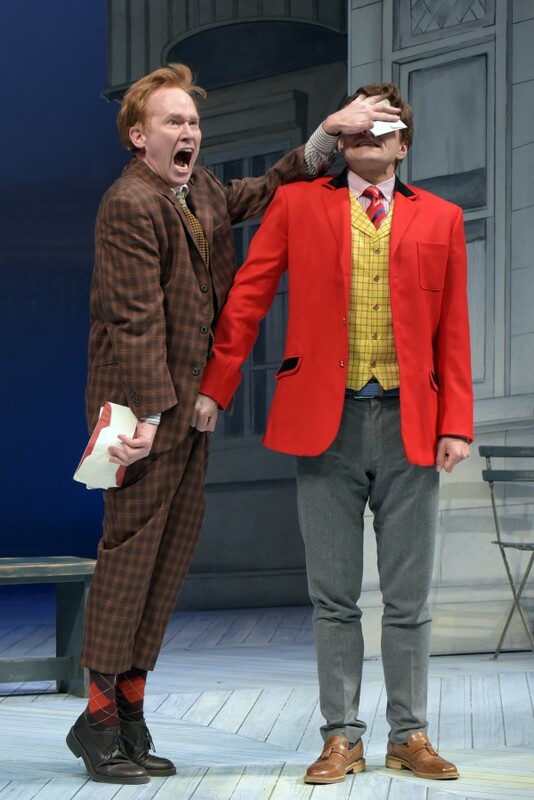 l-r, Dan Donohue and William Connell in a delicate moment in One Man, Two Guvnors at SCR. 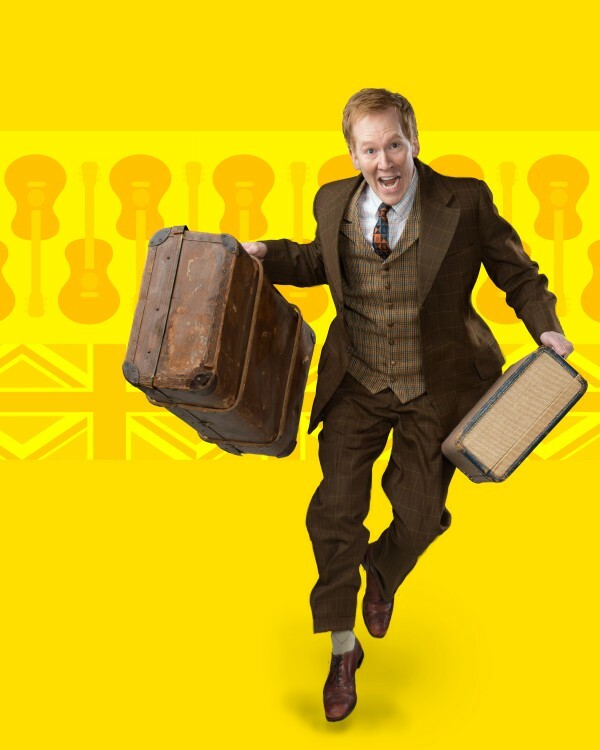 Finally we come to SCR’s One Man, Two Guvnors, the Goldoni update, courtesy of British playwright Richard Bean and American director David Ivers (not to be confused with playwright David Ives). Guvnors’ origins may be the Italian Commedia, but its character is entirely British and its action centered in the seaside resort town of Brighton (just a couple of centuries and a small psychological step away from its 1746 Venetian setting). 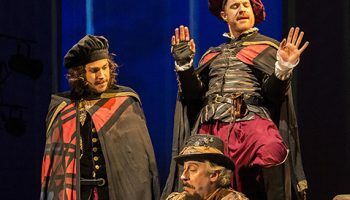 It, too, is a farce, made ironclad by a resourceful central performance by Dan Donohue as Francis Henshall (the “one man”/Servant of the title) and the substitution of stand-up comedy for the original play’s ancient lazzi (or tricks) that reside at the heart of Commedia dell’Arte. We again are confronted by mistaken identities, those of Henshall (one person pretending to be two) and that of Rachel Crabbe (Helen Sadler, impersonating her dead brother as she goes in search of her lover who killed him). Again, the complex plot is less the point than the excuse it provides for the comic inventions that connect its moving parts. And indeed, it delivers some very funny stuff — in one case at least, excruciatingly funny — that sometimes slides over into overextension. This is another play that goes on a tad too long (two hours and 35 minutes), but for different reasons. It is not an excess of monkey business, so much as a dragging out of really funny bits that would be punchier if they were a little shorter. On the other hand, as my theatre companion pointed out, the plot and events are not much more than a framework on which to hang the really juicy stand-up stuff. To be clear, this entire cast gives it its all, and its all is enviable. Deserving a special mention is Louis Lotorto as Alfie, an elderly waiter on rubbery legs who hasn’t found out yet that he might be eligible for a happy retirement. Marcus Högsta, John-David Keller, Brad Culver and Casey Hurt in One Man, Two Guvnors at SCR. A word here about the “skiffle music” played during scene changes by The Craze, consisting of Casey Hurt (vocals and guitar), Mike McGraw (lead guitar) Marcus Högsta (bass) and Andrew Niven (percussion, drums and a stellar washboard). Never heard of “skiffle music”? You’re not alone. Program notes tell us it’s an early 20th century American thing that started in the South consisting of jazz, folk, blues and country music often played on homemade instruments. It seems it swam away to great success in England. You will love it. 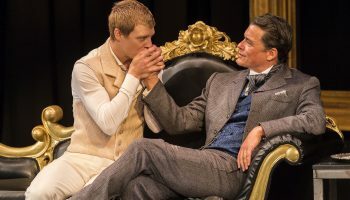 Ivers, an actor and director who serves as the current Artistic Director of the Utah Shakespeare Festival, has emerged as a strikingly fine stager of comic material, Guvnors included. His direction of The Cocoanuts at the Oregon Shakespeare Festival last year qualifies him for the title. 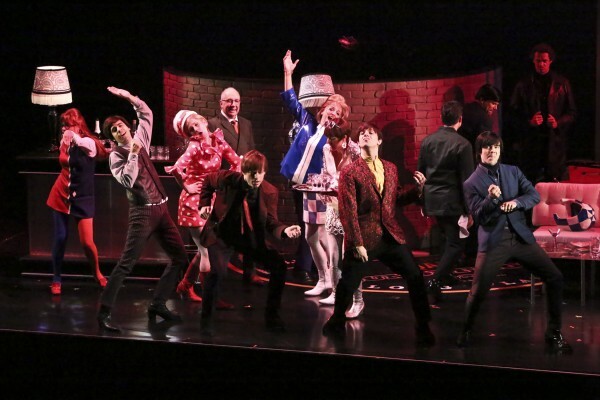 Except for not quite reining in some of the improvised moments in Two Guvnors, he delivers a very clever production. And one more thing. Don’t look for any particular accents in this offering. They are all over the place and nowhere, but somehow, we don’t much care. Dan Donohue in One Man Two Guvnors. 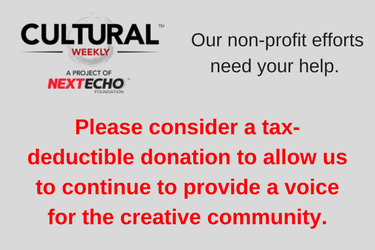 WHERE: South Coast Repertory, 655 Town Center Drive in Costa Mesa, CA 92626. 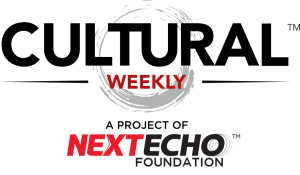 WHEN: Sundays, Tuesdays, Wednesdays, 7.30pm; Thursdays-Saturdays, 8pm; Saturdays-Sundays, 2:30pm. Dark Mondays. Ends with the matinee performance of Oct. 11. ASL-interpreted: Saturday, Oct. 10, at 2:30 p.m.
HOW: Tickets start at $22, available at www.scr.org or by phone at (714) 708-5555 or by visiting the theatre Box Office.